“Settling in” has definitely been the theme of the past couple of weeks. With three weeks of the second semester under our belts now, we are (more or less) settling into our new routines. With the strenuous pace of the first semester still a constant spectre, many of us have resolved to find ways to make things a little easier on ourselves this time around, while still bringing our best effort (others, meanwhile, have seemingly resolved to find ways of making things more difficult. To each their own, I suppose). To that end, I am also in the process of a more literal settling in, as I have moved into a new apartment, located slightly closer to campus. I gave myself a two-week period to move, again in the interest of trying to make things slightly easier on myself, coinciding with the time between the start of Spring Orientation and the end of the second week of the semester. The extra time notwithstanding, the end of the process was still somewhat of a stressful rush. I suppose that’s the inevitable thing about moving. The entire process of renting my first apartment — in a foreign country and culture, no less — was somewhat daunting with many obstacles, not the least of which was the linguistic barrier; my Spanish, while better than it was a few months ago, still isn’t great. With more than a little luck, I happened to contact a renter who, along with her family, has been very sweet, supportive, and helpful through the entire process (and willing to communicate with me in English). As she happens to be based in Barcelona, she was able to arrange for her (English-speaking) sister to show me the apartment. I’d like to give special thanks to my Spanish-speaking friends, namely Sergio and João, who offered linguistic support in messaging realtors, and to Niko for being an excellent burro to help me move my last few things. Over the past couple weeks, the new apartment and I have been spending some quality time getting used to each other. I’ve bought it a few nice things, and in return, it has shown its own very special kind of affection. You could say that there has been a spark between us — or, at least, electric current. After having completed my move at the end of January, just as I was settling in for my first night in my new bed, I noticed that the oven and the metal border of the stove were vibrating slightly. While touching the stove, I happened to bump the metal sink. After a couple more tests (read: successfully shocking myself), I decided that this was most definitely not normal, and — all jokes about me being a good conductor aside — required my landlady’s attention. Within a few days, she arranged for technicians to take a look at my kitchen, accompanied by her mother to let them into the building and to explain the problem. In the meantime, I had noticed that the electrical vibrations extended also to the new dishwasher that had been installed specially for my rental. The technicians came, saw, and, after one of them extracted an apparently-extraneous cable that had been allegedly touching the marble counter, deemed it fixed. Indeed, when I performed my manual test of the connection between the oven and the sink, nothing happened. Then I noticed that the breaker had still been thrown. They were already down the hall and waiting for the elevator when I, after having once again very successfully shocked myself, called them back. Of course, a problem with electrical current isn’t going to manifest if the power is off. So, I got them to fix it for real, and it passed the shock test. After I breathed a sigh of relief, my landlady’s mother suggested that I test the connection between the dishwasher and the sink. It’s always comforting when the reaction to shocking yourself in front of a technician is, “You must be joking.” I assured them that I most definitely was not (and their own test confirmed it), and a second hour of debugging and fixing ensued. Finally, the electricity in the kitchen stopped passing through my body. I’m told that with the way this casa was built, the entire apartment is either not grounded or just not grounded well; they assured me that it’s not fatal. I’m not sure whether they were using “casa” to refer to just my suite or to the entire building (Spanish speakers, your insight is appreciated), but they said that redoing the wiring would take an entire week’s worth of work. I’m not sure that’s on the menu. This was the first time that a professional studio orchestra has played my work. As for the next opportunity for something like that to happen, scroll down to the bottom of this post. Since editing and mixing my recording of “Pero nunca podrá ser” (“But it can never be”), I have written a couple more short pieces for my second-semester courses, which I may post in due time. More on those later. I am also considering posting a few other tracks that I produced for my Video Game Scoring course in the first semester. If you’re interested, leave a comment, send me a tweet, or otherwise get my attention. 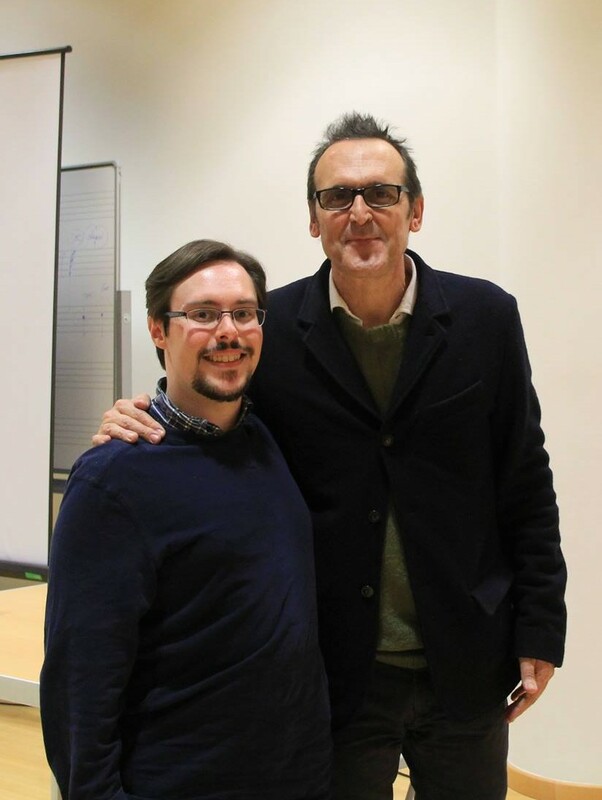 Meeting Goya-winning composer Alberto Iglesias. My courses this semester are largely, in effect, continuations of my previous work. Part 2 in the Advanced Scoring and Advanced Dramatic Orchestration series with Lucio Godoy and Alfons Conde, respectively, Dramatic Electronic Composition with Vanessa Garde, and Advanced Video Game Scoring with Ben Houge build on the foundations laid in the first semester. I am also studying privately with Alfons this semester. In addition, I have decided to join a handful of my fellow composers in taking an undergraduate course on Recording/Mix Techniques, taught by Senior Engineer Pablo Schuller. Advanced Scoring and Dramatic Electronic Composition appear to have more of a focus on electronic and hybrid scoring techniques used in film and television. It was only very recently that it occurred to me that my very first film score, back in 2001, was composed as a synth-orchestral hybrid. I believe that my perspective on that at the time was not so much, “I’m going to sit down and compose a hybrid score,” as it was about choosing the right instruments for the job (it was all MIDI, anyway — we had 128 patches to choose from, and we liked it!). Although electronic composition itself is not new to me, most of my compositional experience to date, both for media and art music, has been in an acoustic instrumental idiom. I am looking forward to expanding my musical palette while, funnily enough, returning to my roots at the same time. After our exhaustive study of instrumentation in the first semester, this semester’s edition of Advanced Dramatic Orchestration seems to be structured as more of an academic study of the subject, while still affording us composition assignments from time to time. Advanced Video Game Scoring will merge our musical skills with technological savvy, dealing with methods to demonstrate and implement video game music. We will be gaining exposure to such tools as Max/MSP, Unity, XNA, and Wwise. Becoming proficient with these tools, all of which are new to me, will be an interesting challenge. For any programmers in the audience, your well-wishes are very much appreciated. In terms of recent compositions, the past week has seen me produce a short electronic cue, loosely inspired by the soundtrack to Homeland, and a dramatic cue for strings based on the opening scene from No-Do (“The Haunting”), which was originally scored by Alfons. While my composition schedule overall for this semester is not yet as clearly-defined as it was in the fall — we are not, for example, producing new material each week for Dramatic Orchestration this semester — I am content to wait and see what lies ahead. As well, in contrast to the eight official recording sessions from last semester (with the latter five over the course of the final seven weeks), we are currently scheduled for only five this time: two specifically for Advanced Scoring (one in two weeks’ time, the other at the end of April, right after Spring Break), one with the Budapest Art Orchestra for Dramatic Orchestration in the week before Fallas in March, an instrument-sampling session for Dramatic Electronic Composition at the end of March, and a recording session with composer and producer Mason Daring, who is slated to visit us in April. Moreover, I am given to understand that the nature of these recording sessions will see me more in the role of producer than conductor. I hope that I will be able to keep my baton skills up in spite of this, because all of this is leading up to the biggest recording session of the year and the capstone of our experience here at Berklee in Valencia: a trip to London to record at AIR Studios in late May. The scope of the London recording will be an orchestral cue totaling no more than 2½-3 minutes’ duration. That being said, I am in the process of seeking a short project that would benefit from a 50-piece professional studio orchestra providing its soundtrack. Readers, please spread the word!